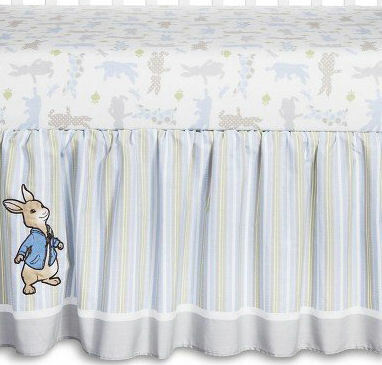 Our decision to make our own bedding and Peter Rabbit nursery decor came from our family's chosen profession. You see, this mommy and daddy own and operate a rabbit farm. This being the case, we thought that it would be really cute to decorate our baby boys nursery in a Peter Rabbit nursery theme. I decided to buy a pattern and make the crib set myself using a Peter Rabbit nursery bedding ensemble that we found for sale on an auction site as an inspiration piece. Go here to see the baby blue crib bedding set that I used as an example for the baby bedding that I designed. We got the fabric for the crib set and curtains as well as everything we needed to complete our baby boy's nursery for an amazingly cheap price which made me feel a lot better about the money I spent to buy a sewing machine. I feel very fortunate that we have such a wonderful business and that we have such a precious, healthy baby boy. He is now 7 months old and we have never gotten tired of his Peter Rabbit-Beatrix Potter nursery theme and as we had hoped, he loves to play with bunny rabbit toys. My husband and had so much fun with our bunny decorating ideas and want to share our nursery picture with our friends at Unique Baby Gear Ideas. That is an idea. I love the idea of including our forest friends and storybook characters in the baby's room! I love your fabric, Sug. Could you please tell me where to buy it? Join in and write your own page! It's easy to do. How? Simply click here to return to BEATRIX POTTER NURSERY PICTURES and IDEAS.